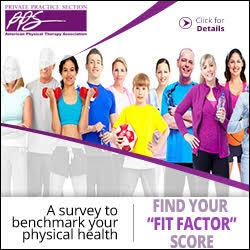 Years in physical therapy: I have worked in physical therapy for 20 years. My first job out of college was as a marketing coordinator for a large physical therapy practice with over 50 locations. From there, I grew to learn all aspects of running a practice including billing, credentialing, compliance, human resources, IT, and much more. I now work as the vice president of operations for MRS Physical Therapy and Medical Rehabilitation Systems. Most influential book: Who Moved My Cheese? : An A-Mazing Way to Deal with Change in Your Work and in Your Life, by Spencer Johnson. I love this book because it is a great lesson for all aspects of your life. The book is a parable about four characters who live in a maze and go to one particular location every day to eat cheese. One day the cheese is gone. The story follows how each character reacts. My favorite quotes from it are “If You Do Not Change, You Can Become Extinct”; “What Would You Do If You Weren’t Afraid?” Adapting to change is necessary to grow personally and professionally and this book is a great reminder of that. How do you like to spend your free time? I like to spend my free time outdoors when possible either running or hiking. I am very competitive so I enjoy participating in 5ks and 10ks. I also like to take Pilates and hot yoga classes. Since I spend a lot of time behind a desk, I like to stretch my legs whenever possible. What do you like most about your job? I love the challenges that come with my job. You can never be sure what each day is going to bring. For example, you can have a full day planned on your calendar and then the Medicare surveyor walks in and your day changes on a dime. I like to be able to rise to the challenge. I also enjoy taking care of the administrative and management aspects of running a physical therapy practice, so my physical therapists can focus on delivering excellent patient care. I feel by running the administrative end of the practice smoothly, I am working “behind the scenes” to help patients have the most positive physical therapy experience possible. What do you like least about your job? I do not like how hospital systems are controlling physician referrals. I was marketing to a physician recently about a specialty program offered at one of our locations. The physician’s practice was owned by a hospital. The physician told me he would not refer to our practice even if he had a patient who would benefit from our specialty program. I quote: “The hospital signs my paycheck and that is where my referrals are going.” Patients have a choice and are being led to believe otherwise by hospital-owned physician practices. I do not like this lack of transparency. Therefore, at MRS we direct a significant amount of our marketing efforts towards patient education regarding choice and direct access. What is the most important lesson you’ve learned? When hiring staff, impressive credentials on a résumé do not necessarily equate to an impressive employee. Some of the most successful office staff that I have hired did not have any experience in physical therapy. However, what they did have was a desire to learn and a temperament to succeed. Describe your management style: My management style is to lead by example. I try to demonstrate dedication, discipline, patience, persistence, honesty, flexibility, loyalty, and accountability in my position and seek to cultivate those qualities in my employees as well. I encourage teamwork at every opportunity. For example, as a small company, employees may need to pitch in and help out in different areas. I can’t expect my employees to do so if I am not willing to do so. Therefore, it isn’t unusual to see me sitting at the front desk greeting patients or vacuuming the clinic if the need arises. As a result, I have a team of employees who are willing to do the same. Describe your marketing strategy: At MRS we focus on word-of-mouth marketing and direct access. With more and more physician practices being owned by hospital systems, it has become very challenging to market to physicians. Thus, we begin marketing to our patients as soon as they make their first phone call to our office and we continue throughout their course of care. We start by making the registration and appointment process as easy as possible for the patient. When the patient first walks in the door, each office has a large poster in the waiting room explaining the concept of direct access. We explain our patient referral program after the patient has successfully completed their first week of therapy. We also use mailings, emails, texts, and telephone calls to maintain contact with patients throughout their course of care and after discharge. Our goal is to become each patient’s “family physical therapist.” After all, if you choose your family physician, why shouldn’t you choose your family physical therapist? This has been our most successful marketing strategy to date and the most necessary one considering today’s health care environment. What unique programs do you offer that set you apart from the competition? At MRS, we offer many programs and our therapists have many certifications which set us apart from our competitors. These include LSVT BIG, TMJ, McKenzie, and ART. We also offer WorkWell functional capacity evaluations, functional job analysis, and pre-work screens. What do private practitioners need to do to thrive in today’s health care environment? I feel the key to surviving and ultimately thriving in the current health care environment is word-of-mouth and direct access marketing. Hospital-owned physicians are increasing at dramatic rates. Hospital-owned physicians send referrals to hospital-owned physical therapy. Therefore, private practitioners need to take their marketing directly to the patient. Describe your essential business philosophy: “Every client you keep is one less that you need to find.” Nigel Sanders Best decision/benefits of PPS membership: My best decision was to complete the Administrator’s Certificate Program offered by the PPS. The Administrators program truly gives you the tools to successfully manage your practice. Furthermore, by joining the Administrators Council I am part of a network of administrators who are in the same position as I am. The educational webinars, newsletters, and ability to message other administrators make being a member of the council yet another powerful tool in my administrator’s arsenal. Worst decision: The worst decision I have made was to allow an employee to stay employed with my company longer than I should have. The employee was not completing the most basic functions of her job. The employee was coached, warned, and put on probation. I personally liked her and at one time she was a good employee who did an excellent job. I think I let her past performance cloud my judgment regarding her rapid decline in performance. Eventually I did fire her but not as soon as I should have. It took months to sort out the mess she left behind. This was a valuable lesson learned. How do you motivate employees? I motivate employees by allowing them to take ownership of their projects and work. I do not micromanage. I give them the space to find their way but give guidance as needed. I also give positive feedback on a regular basis. I acknowledge big accomplishments as well as small ones. For an example, if I see a Facebook post I like on our company page, I make sure to let the employee who posted it know I saw it and appreciated it.